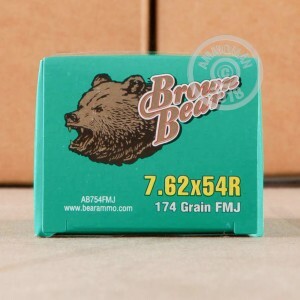 This Brown Bear ammo is a great way to get some range time with your Mosin, Dragunov, or other 7.62x54R rifle. 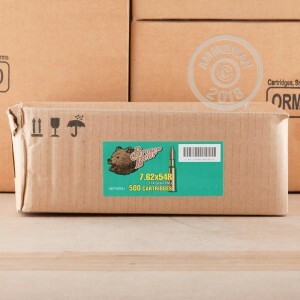 Manufactured in Russia at the historic Barnaul Machine Plant, these cartridges come in a 500 round bulk case (25 boxes of 20 rounds each). Each round fires a 174 grain full metal jacket bullet and uses non-corrosive Berdan primers and steel cases. 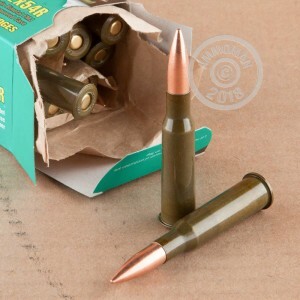 This ammo's steel components give it magnetic properties which may not be suitable for all indoor ranges. The Barnaul Machine Plant produced much of the Soviet military's ammunition supply during World War II. Today, it operates as a private business and exports ammo all over the world.